After having many successful years of hosting a CWSNF KS3 Football tournament, it was about time KS4 students had a tournament of their own. Six teams were entered for the debut year with The Park School coming out on top in the final winning 0-1. The curtain raiser of the tournament was between the first & second Abbey sides. Even though Abbey United were seen as underdogs, they rose to the challenge and won 1-0 from a Jimmy McKenna goal. This was a real wake up call for Abbey F.C as they drew 1-1 with The Park (a game where they had plenty of chances to win) and won their remaining games, finishing third in the table, earning a place in the 3rd place play-off. Not to be outdone by their peers, Abbey United went on to win all their games apart from a 1-0 defeat to The Park. This meant they finished second and were straight into the final. For reasons outside of their control, Abbey United didn’t have any substitutes but showed great resilience, organisation, and courage to not only participate in each match, but to be the enforcers as well. Perhaps a bigger success was the performance of and the experience gained by the Abbey Athletic students. A group of players, including some who don’t even usually play football and find it hard to engage in group activities, rallied together to produce their own magic. And they certainly saved their best until last in one of the most entertaining matches of the tournament, a 2-3 defeat at the hands of St Phillips 2. St Phillips were 0-1 up and starting to find their rhythm until Will Wyld made an incredible save, kicked the ball towards Angus Telfer-Smollett, who turned on the spot like Baryshnikov on Broadway, causing confusion at the back and forcing the defender to put the ball in his own net. Not to be out done with his choreography or finishing prowess, Ethan Prince pirouetted on the edge of the box to volley home, following great work by Matthew Tribe, to make it 2-2. Even though it ended 2-3, Abbey Athletic certainly weren’t there just to make up the numbers, and a lot of the credit goes to captain Taylor Watts, who stepped in last minute and led from the front. A new tournament: a new format. Straight to the business end of the knockout rounds. Abbey F.C vs. St Phillips 1 for 3rd place. After a tightly fought 0-0, it was penalties. With Nikee Cracknell making some brilliant saves, and a coolly placed penalty by Leo Long (the tournament’s top scorer with 8 goals) Abbey F.C had secured 3rd place. Seconds after the 3rd placed play-off had finished, the final kicked off. An incredibly close game with Abbey United having the better of the chances, including a curling effort with the outside of the foot from Rory Lynch, hitting the post. As the game timer had finished, the ref was determined to see a winner in regular time to save the intense pressure of penalties. Play continued, the ball broke through a scrappy brawl and was poked home. The Park had won the first CWSNF KS4 Tournament 0-1. Once again, members of the CWSNF & Aldershot F.C were present to oversee the award ceremony. Aldershot midfielder Jake Gallagher in particular was grabbing the attention of many students, signing autographs and taking pictures, before handing The Park School their deserved trophy. After the inaugural event’s success, there will surely be more to follow and the title can only grow in stature. 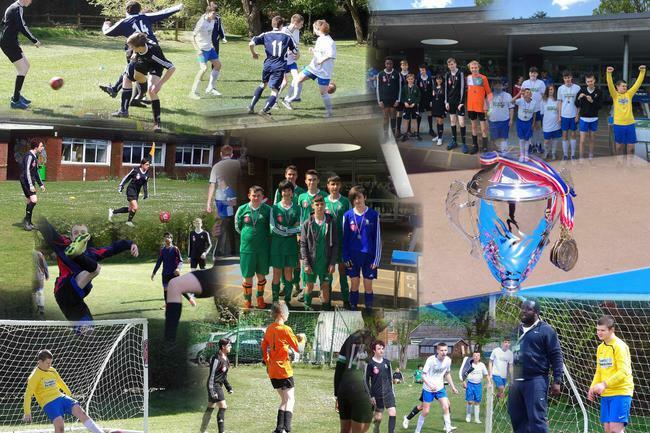 After hosting two magnificent football tournaments, The Abbey School would like to thank everyone involved; from Farnham College, to Aldershot F.C, the CWSNF, and The F.A. But most importantly, the schools & students who participated. Some people still deride football as ‘just a game’, or despise it for ‘its modern attitude’, the money, because it’s mainstream, and so on. All of which are perfectly acceptable. However, if you’re lucky enough to experience football in its purest form, like I have because of these tournaments, where students have; cried with joy proclaiming “It’s the happiest I’ve been”, demonstrated an attitude to do the best they can, worked together, socialised with other students, felt like they’re part of something, all of which can be hard to come by for the students we host, you would know, that football isn’t, just a game.